Please fill in the form completely. Be patient and allow us time to respond to your questions/requests. If you require an immediate answer, feel free to call or fax us directly. PH: 435-676-8950 / FX: 435-676-8952. For more information please fill out the form given below. Jerry and Jan Drummond, resident managers, along with Jesse, their yellow Lab, want to make your stay with us the most memorable experience of your summer. 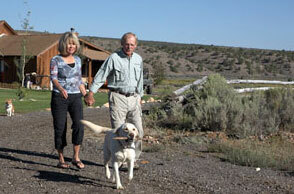 Jesse spends most of his days romping about the property with our guests and/or their children. Many of our visitors consider us a destination to visit the local attractions and then return each night and enjoy the peace and tranquility of the Ranch. With our beautiful blue skies, star-filled nights, and stunning scenery that's filled with wildlife, Cottonwood Meadow Lodge can be the perfect location for your next trip.